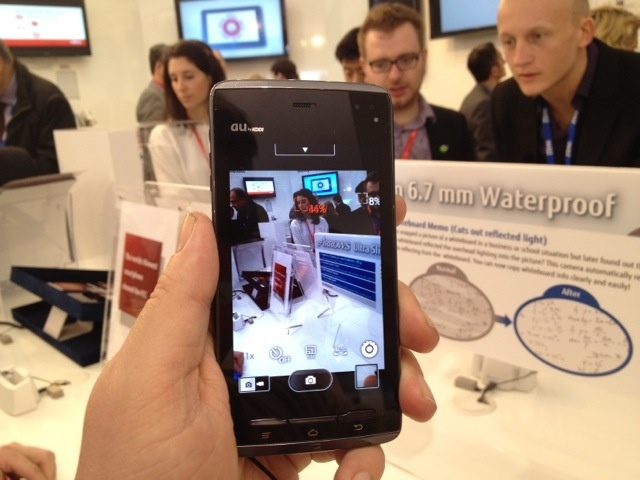 BARCELONA, MOBILE WORLD CONGRESS 2012 — Fujitsu’s made the first Android phone that I, as an iPhone lover, found myself drooling over… which makes it a doubly good thing that the phone in question is waterproof. And not just waterproof! As thin and light and as perfect in the hand as a dream. The only problems? Because of Fujitsu’s bizarre way of selling their devices, this phone, which has been on sale in Japan for months, doesn’t even have a set name. And forget about getting one Stateside. How does a company make a phone this beautiful and then have no idea how to market it? The phone in question is called different things by different carriers in Japan, China and Taiwan. In fact, in a move that strikes me as downright perverse for a company that has made a phone this beautiful, Fujitsu doesn’t even put their name on the device. And what’s that device called? Fujitsu will only call it the unremarkable Ultra Slim 6.7mm Waterproof Smartphone. And, in fact, the phone does exactly what it says on the tin. It’s not the specs of Fujitsu’s phone that made me go wild. In fact, they’re sub-part pretty much across the board, at least according to the standard of the top-of-the-line 2012 smartphones blazing up Mobile World Congress. It’s running an obsolete version of Android, Gingerbread 2.3. It only has a single-core processor (albeit running at 1.4GHz). 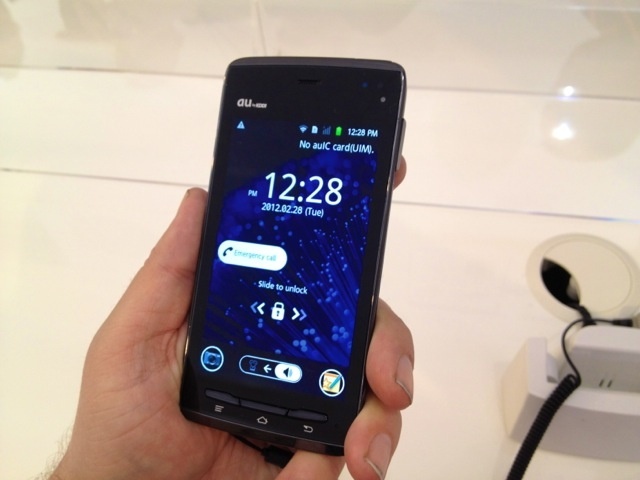 The 4-inch display is a paltry 800×480 AMOLED, the camera a mere 5.1MP, the battery life about 6.5 hours of 3G talktime. Attached to any other phone, you’d blah. But when Fujitsu says this thing is thin and ultralight, they’re not kidding. It’s the thinnest phone I’ve ever seen: a 6.7mm, 105 gram wafer of a device that manages to be both light and yet feel perfectly balanced. I’ve handled a lot of smartphones in my time, yet this is the first one that has felt better than an iPhone in my hand. This is a phone that is as effortless to carry around as a thought. And that’s just the thing: its specs are actually just fine, and it feels plenty fast, except when judged against phones that tow the current Android line of being the size of a paperback novel. Fujitsu’s made a great phone here just in managing to cram this sort of performance into a device that is a third as thick as the iPhone 4S, already a supremely thin device. But the technical craftsmanship is just out of this world. I’ve already mentioned how great the device feels in the hand — something more akin to having someone lightly press their palm against yours than the usual thick weight of a phone — but what truly impressed me was that it did so without sacrificing toughness. The chassis is made of plastic, sure, but the display isn’t: it’s good old Corning Gorilla Glass, just like the iPhone. Even better? This phone is waterproof. 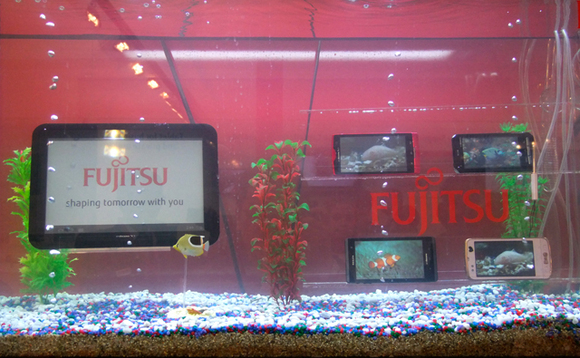 One of Fujitsu’s huge kicks at this year’s Mobile World Congress is showing that their devices can operate underwater. Having once ruined a phone by dropping it in the toilet, I’ve been intrigued by this technology during Mobile World Congress, and have spoken to many of the purveyors of waterproof solutions to figure out how this stuff works. Across the board, it’s usually accomplished by a superhydrophobic coating of some kind, either applied to just the outside of the device, or to the inside of the device as well. And I was told as recently as Sunday we wouldn’t see any phones on the market that used superhydrophobic coatings until at least later this year. So the fact that Fujitsu is selling a waterproof phone now — and, in fact, have been showing one operating in a tank of water for the last three days — piques my interest. I asked Fujitsu what technology they were using to accomplish this: HzO? LiquiPel? Their own custom coating? I wasn’t prepared for their answer: they’re not using any coating. Fujitsu’s using proper, old-fashioned gaskets and excellent build quality to make sure all of the ports and crevices are sealed up tight. Amazing. I absolutely love this phone, which makes it even more maddening that it’ll probably never come to the States. Fujitsu says they’re intending on coming to the United States and Europe soon, and are talking to the carriers, but it’s still a ways off. What I don’t understand is how Fujitsu can make a phone this great, this solidly built, and then just completely fail at marketing it. If Apple had made this, they’d give it a beautifully evocative name — the iPhone Aqua? — and make sure everyone on Earth knew they’d made it. Fujitsu? Not only are they barely taking credit for it, they didn’t even give their amazing new phone a name. Jesus, guys. Get a clue.